Our services cover the spectrum of youth justice, from crime diversion and prevention through to intensive supervision and surveillance and reparation. We aim to prevent first-time entrance into the criminal justice system, intervene when young people have committed an offence and support young people already subject to youth justice. The number of first time entrants to the youth justice system has fallen by 75% since 2003/041. Today, those who remain in the system tend to have far greater, more complex needs and higher rates of reoffending. 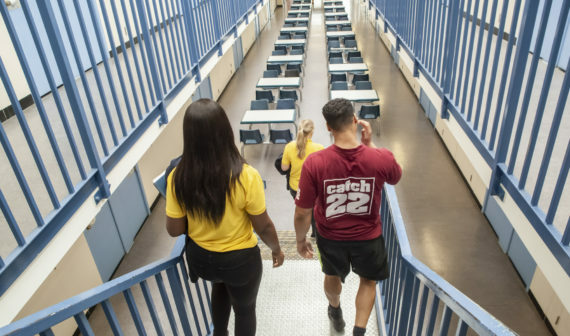 To face up to these new challenges a greater emphasis is needed on understanding both what leads young people to offend and which interventions work best to reduce the risk of reoffending. We deliver a range of services that cover the spectrum of youth justice, from crime diversion and prevention through to intensive supervision and surveillance. We aim to deliver a more rehabilitative, restorative and effective justice system for people with convictions, victims and communities. At the heart of this is our belief that relationships are crucial to effective desistance from offending. In addition, we provide many of the key components of a good youth offending service. We deliver high-level family support, run alternative education provision, support people into employment and casework high risk young people. We also successfully deliver many of the wrap-around services to young people at risk of offending. These include bespoke gangs programmes, victim work and services that support children who go missing and/or are victims of sexual exploitation. Working with local authorities, partner agencies and charities, our services identify suitable reparation projects, including charity shop work, supporting food banks and cleaning graffiti. Our aim is for young people in custody to take responsibility for their actions, make amends and not commit further offences. Community reparative sessions encourage young people to reintegrate and take pride in their local community, while paying back for their crime and learning new skills. Statutory Appropriate Adult provision as defined by the Police and Criminal Evidence Act 1984 (PACE). Our Appropriate Adults, who are mostly volunteers, provide a service for young people at the police station or in court, ensuring they understand the process and supporting them on bail. Catch22 are members of the T2A Alliance and are committed to delivering services based on maturity rather than age. Successful transition from youth to adult justice services requires tailored support; this underpins the development of all of our youth justice services. ISSPs are statutory services by court order, involving daily support for under 18-year-olds facing a custodial sentence or a remand to custody. Our ISSP services steer young people towards positive pathways, focusing on constructive activities and practical advice. We support young people in custody through statutory community remand programmes as an alternative to custody and to address the risk of offending. We work with the young person to address wider issues including substance misuse and anger management. Our Humberside Positive Lifestyles and Suffolk Positive Futures services use sport, physical activities, arts and education to engage vulnerable young people, connect them to their community and prevent them from entering the criminal justice system. Contact us if you have an enquiry about Catch22’s youth justice services and a member of the team will get back to you as soon as possible. Talk to us about how we can work with you to deliver youth justice services.